The CamRecord Sprinter series from Optronis gets a new addition to the family: the Sprinter-FHD. With full HD resolution of 1,920 x 1,080 pixels, the Sprinter-FHD achieves over 1,800 images per second. The camera is controlled via the TimeViewer software, which now also offers functions for object tracking with the current release in order to be able to analyse image sequences automatically. 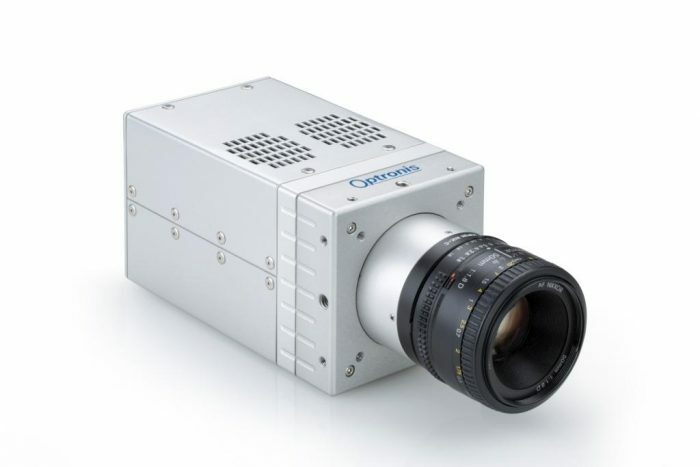 The Sprinter-FHD in the CamRecord Sprinter series from Optronis has a light-sensitive CMOS sensor and offers full HD resolution at a frame rate of over 1,800 images per second. Various trigger and synchronisation options make the Sprinter-FHD a suitable tool for recording fast processes simply and making them accessible for accurate analysis. The image data is buffered in a fast 16 GB memory, before being saved either to an SSD hard disk internal to the camera or on a PC. An object tracking function is integrated into the latest version of the TimeViewer software supplied with every Sprinter-FHD. This allows objects, or points tagged using a marker, to be tracked automatically from image to image. Tracking is at sub-pixel accuracy, enabling precise recording of the path of an object. In addition, changes in angle or velocity vectors can also be recorded. All data are displayed using the software or exported for individualised analysis. Tracking not only simplifies motion analysis in research, but also fault analysis and quality assurance. “Our CamRecord Sprinter series is well known for good resolution at high frame rates. With the Sprinter-FHD, we will further raise these values. It closes the circle to our new release of the TimeViewer software. With full HD resolution and tracking now integrated, we can run accurate analyses, which promises attractive results in many areas of application,” says Dr. Patrick Summ, managing director of Optronis GmbH. Optronis presented CamRecord Sprinter cameras with integrated tracking function in TimeViewer at last year’s VISION in Stuttgart. The Sprinter-FHD is available from Q1/2019.